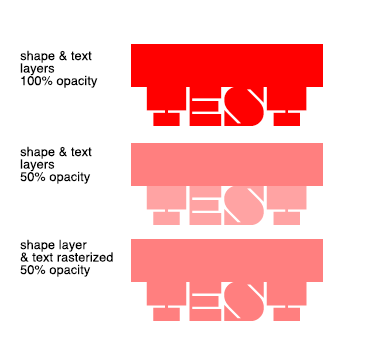 Anyone knows why two different layers (a shape and a text) with the same opacity (54%), fill (100%), blending (normal) and color (#000) render with different brightness? I have noticed that it is actually the text layer which renders wrong - so when grouping the text layer and setting the opacity of the the group to 54% it renders correctly. May it just be a bug or do I miss something here? Not a bug - it's because text is blended using a different gamma in order to make the antialiasing look better. 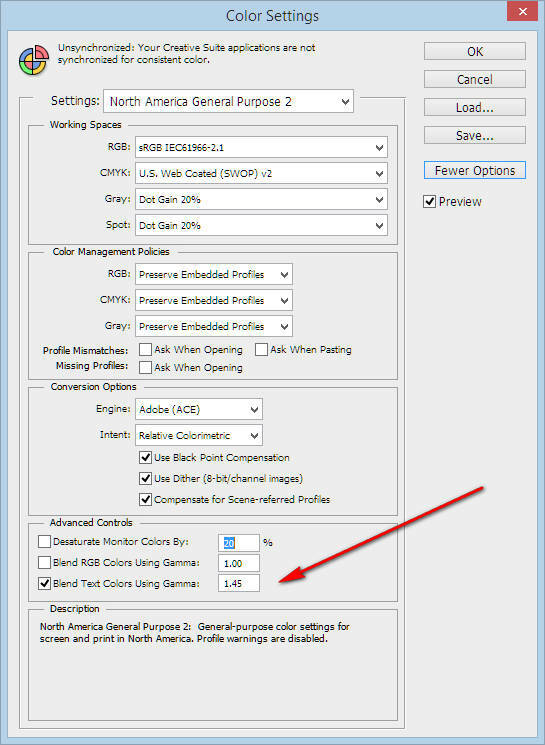 You can disable that in the color settings. This has me really stumped! After checking your PSD I decided to run some tests in a new document and I'm getting exactly the same results. Even after closing Photoshop, restarting and starting fresh.. I get the same results again. I was sure this has never happened before but even opening old PSDs I get the exact same result, so unless your PSD has somehow affected Photoshop then I'm guessing this is a bug. If this is a bug i'm surprised that I've never noticed and as far as I can find, nobody else has. After further testing, it seems the issue only occurs in RGB documents. The issue doesn't occur in CMYK, Lab Colour or Greyscale documents. I also tested a number of RGB color profiles and all the profiles I tested reproduced the issue, although to varying degrees. The default sRGB profile was the least affected out of the random selection of profiles I tested. I have no idea what the issue could be, but it seems like a technical one. I downloaded your PSD and the colors look identical to me, both in the PSD and when exported as a PNG. Although, it does appear that the PNG exports a slightly lighter shade, overall. When I originally opened this file, the colors were identical, as I showed above. When I hid one of the layers, the colors then changed to reflect the issue you're having. I'm at a loss, on this one. This behavior repeats itself each time I open the PSD. How to design a websites using thin fonts that will look good in a web browser? how do I fill a shape with other small objects and text in photoshop? How to flip Brightness and preserve color in Photoshop? How to edit text that is in a jpg photo (using newer technology)?